There were parts which were quite puzzling, for example, the police sees a picture of a Haitian monument in his rubbish and thinks he's going to Haiti, but turns out of course he's going to Venezuela. But why does he have a picture of that monument there? Supposedly he knows they shouldn't go to places with tourists, as he's tipped off by an ex-prison breaker. Also, they have supposedly gone to Canada to board a plane for Venezuela, but I think Pittsburgh and Canada are quite far away...? Anyway...like S said, this kind of film is not supposed to be flawless and logical...but it's a good film nonetheless. Apart from being very gripping like I said, it's also touching. Russell Crowe's character's never ever questioned his wife's innocence, when every evidence shouts that she's guilty. He doesn't even ask her once if she has done it, and transforms himself into a totally and dramatically different human being, forsaking his everything, just to get her out of prison. I was particularly touched by the scenes in which he tells his wife behind bars that he does not believe that she's capable of it, and what she's experiencing will not be her life. And he keeps his words. Another scene I find particularly touching is when the normally indifferent father of Crowe's character (who has been observing his son quietly) finds out about his son's plan, he embraces his son in their last encounter and tells him to take care. 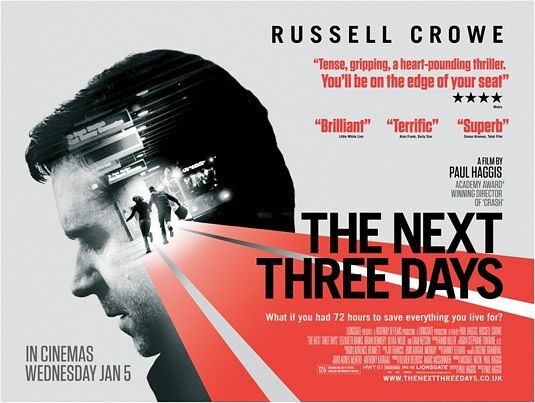 Last word: Russell Crowe's very good in this film I think!! !